Watch a 30-second promotional spot about the series! You'll need the RealOne Player (www.real.com) to see the video clip. Watch the 45-second opening animation for Reading Rocks! You'll need the RealOne Player (www.real.com) to see the video clip. Reading Rockets: Launching Young Readers is an engaging nine-part public television series on reading. It was created for parents, grandparents, teachers, caregivers, and anyone else who touches children�s lives. Based on the latest research findings, each half-hour program examines a stage young children go through in developing their reading skills. Program 1: "The Roots of Reading" looks at the earliest stages of literacy in such locations as a baby speech lab and a Head Start center. The program examines how parents, childcare providers, and kindergarten teachers can get children started on the road to literacy. Program 2: "Sounds and Symbols" focuses on how children learn the relationship between sounds, letters, and words as an initial step before being able to decode the printed word. Program 3: "Fluent Reading" explores the ability to decode quickly and achieve fluency. The program also demonstrates how early testing and intervention can help struggling readers. Program 4: "Writing and Spelling" examines the connection between reading, writing, and spelling. The program features successful methods for encouraging children to write and build their vocabularies. Program 5: "Reading for Meaning" highlights effective strategies to help kids understand � and care about � what they read, which is the ultimate goal of learning how to read. A special just for kids: "Reading Rocks!" uses wacky humor and stories of hope to encourage struggling readers to keep trying. The program also helps parents and teachers understand the emotional impact of reading troubles and offers ways to motivate struggling readers at home and school. Program 6: "Empowering Parents" visits schools in Huntingtown, Maryland, and Portland, Oregon, to help families identify early signs of reading problems and find ideas for getting their kids the help and support they need. Program 7: "Becoming Bilingual" examines the challenges of teaching children to read in a new language. This show visits schools and programs in six cities across the country to learn about the different ways schools are working to create bilingual readers. Program 8: "Reading and the Brain" explores how brain scientists are working to solve the puzzle of why some children struggle to read and others don't. Startling new research shows the answer may lie in how a child's brain is wired from birth. 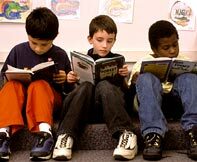 Program 9: "A Chance to Read" looks at the reading challenges facing kids with disabilities and what schools across the country are doing to help them find success. Program 10: "Toddling Toward Reading" examines what it takes to give our preschoolers the early literacy skills they need to become successful readers. Reading Rockets: Launching Young Readers incorporates the latest research and features the country�s top reading experts. The series takes viewers inside homes, classrooms, and research centers to show what works in helping kids learn how to read, particularly those who struggle with mastering what is ultimately a life altering skill. The programs were filmed in more than 40 elementary schools, preschools, and community centers in 17 states. Among the sites is the legendary Lab School in Washington, D.C., which specializes in teaching students with learning disabilities. Bestselling author Frank McCourt, along with Fred Rogers, Annette Bening, Deborah Norville, Vivica A. Fox, Nick Spano, Al Roker, Rita Moreno, Henry Winkler, Molly Ringwald, and Reba McEntire host the programs. Each has a personal connection to the joy and importance of learning to read. McCourt, for example, taught English in the New York City school system for 27 years before writing his Pulitzer Prize-winning memoir, Angela�s Ashes. The programs also feature prominent children�s book authors – Norman Bridwell (Clifford the Big Red Dog), Kate Duke (Aunt Isabel Tells a Good One), William Joyce (George Shrinks), Walter Dean Myers (Harlem), Rosemary Wells (Timothy Goes to School), Christopher Myers (Black Cat), Nikki Giovanni (Rosa), and Sandra Boynton (The Belly Button Book). Reading Rockets: Launching Young Readers is a co-production of public television station WETA/Washington, DC and Rubin Tarrant Productions. The series is part of WETA�s national initiative called Reading Rockets, which is funded in part by the U.S. Department of Education and dedicated to giving parents, educators, and caregivers the information they need to help young children learn to read. The main Reading Rockets website, which provides daily updated information for parents and educators on teaching kids to read and helping those who struggle, is at www.readingrockets.org. WETA is the flagship public broadcasting station in the nation�s capital. Its productions and co-productions include The NewsHour with Jim Lehrer, Washington Week with Gwen Ifill and National Journal, the On Stage performance series, and documentaries by filmmaker Ken Burns, including The Civil War and Unforgivable Blackness: The Rise and Fall of Jack Johnson.